If your only experience of mince pies at Christmas comes from the ones your boss brings into the office as a contribution to seasonal cheer you probably have a pretty negative view of this traditional Christmas pastry. They will invariably have come from a supermarket, will have pastry that would sink a battleship and a meagre offering of filling. The only taste sensations you'll get from them will be sweet and fatty and they'll leave you with a lingering regret that you didn't have the willpower to just say no. There are a few exceptions, of course, but a mince pie should not have a long shelf-life. It should have thin crisp pastry, be bursting with juicy, spiced fruits and be eaten the same day it is made. Fresh from a good baker they are worth waiting all year for but best of all is to make your own and eat them still warm from the oven. Bath-based baker, Richard Bertinet, introduced me to the idea of a frangipane topping to mince pies instead of sandwiching the filling beyween two layers of pastry and it is, I think, a wonderful idea. I've made them this way for the past couple of years and am hooked. The lemony pastry in my recipe is the one I always use for mince pies. The sweet mincemeat is home made but you can buy good mixes now if you don't want to make your own. There's nothing wrong with using a good jar of mincemeat for this recipe but if you live in London, Neal's Yard Dairy keep a particularly good mix which you can buy in whatever quantity you want. Sally Clarke in Kensington Church Street sells her own mincemeat, and mince pies by the half dozen which are filled to the brim. 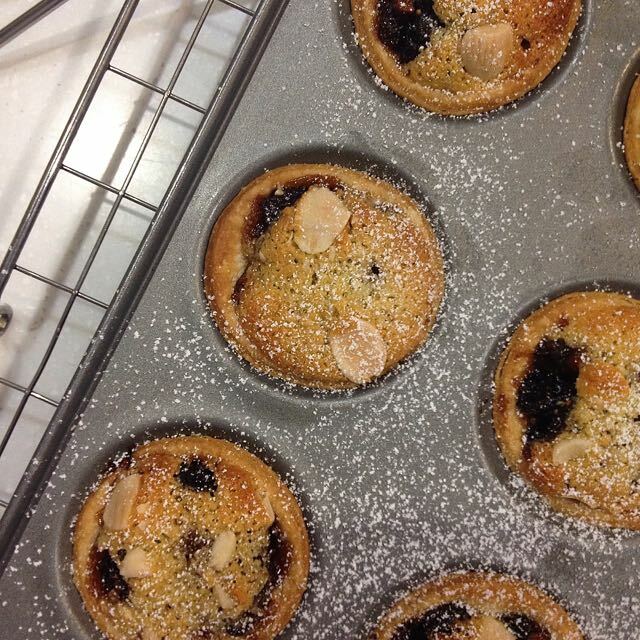 Claire Ptak at Voilet Cakes also sells very fine mince pies if you'd rather let someone else take the strain. As food historian Ivan Day says, a lot of nonsense has been written about the history of mince pies. You can read what he has to say about their origins here. His reproduction of the recipe Minc't Pie published by Gervase Markham in 1615 in his book The English Housewife is worth checking out to see how much the recipe, and our taste, has changed in four centuries. It's important to get the balance right for mince pies. The pastry must be thin and, in this version, the mincemeat and frangipane of roughly equal proportions. If you don't want to make the frangipane, topping the pie with a pastry star - as Sally Clarke does - or a crescent moon will give you a lighter result than the usual mincemeat sandwiched between two pastry discs. Sift the flour into a mixing bowl and add the ground almonds and salt. Add the butter and rub in with fingertips. Sift in icing sugar and add grated lemon rind and mix. Lightly beat the egg yolk and milk together and stir into the dry ingredients. Mix until the dough just comes together then turn out and knead gently to smooth the surface. Cover and rest in fridge for just 30 minutes. Mix butter until soft. Mix in the sugar until the mixture becomes pale. Add the egg gradually while still beating. Add ground almonds and mix well for 1-2 minutes. Heat oven to 180C(gas 5). Lighly butter 24 shallow patty tins. Roll pastry out thinly on a lightly floured surface. Use a 6cm(2½ inch ) cutter to stamp out 24 rounds to line the tins. Add a heaped teaspoon of mincemeat and top with a heaped teaspoon of frangipane. Scatter 3-4 flaked almonds on each pie. Bake for 20-25 minutes until golden. Serve dusted with icing sugar.